Sage Summit San Diego: Visit DSD at Booth 7 to WIN $500! 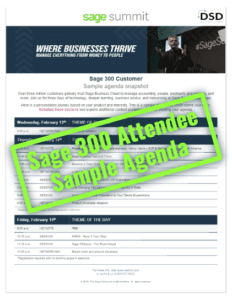 Over three million customers throughout the globe trust Sage Business Cloud to manage accounting, distribution, payments and people, and we are thrilled to be offered a product showcase as a premier Sage partner at this year’s west coast event! Visit us at Booth #7 to see our latest Sage Enhancements & Extended Solutions! For those already registered, make sure you select your agenda ASAP as some of the courses will fill up fast! Check out the the PDFs here to find a personalized content journey based on your product and interests. 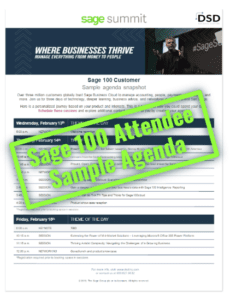 There is a suggested attendee agenda for both Sage 100 clients and Sage 300 – inclusive of both legacy and cloud versions. Schedule these sessions to align with the future of your business but also feel free to explore the full list of sessions offered in order to create a meaningful experience. Sage Summit registration includes an all access pass to all of the scheduled events found in the agenda as well as opportunities to network with fellow industry professionals and enjoy the beautiful San Diego sunshine! Contact us to receive $100 off registration! Contact us to receive﻿$100 off registration! We look forward to seeing you at booth #7!